Disruption; breaking down: This winter's heavy ice and snow resulted in a cataclasm of electrical and phone lines in several parts of the country. 1. A sudden and violent upheaval or disaster that causes great changes in society: The revolution could result in a worldwide cataclysm. 2. A terrible and devastating natural disaster; such as, a flood: An earthquake can cause a great cataclysm; especially, in a densely populated area. The summer cataclysm of hail and heavy rains caused a cataclasm of the dikes along the river and a terrible cataclysm of flooding in the river bottoms. "A cataclysmic event is happening in the oil producing country that is threatening to reduce its oil exports to zero within the foreseeable future." 1. Something that causes great destruction, violence, upheaval, etc. : During the winter of 2013 and 2014 there were floods, extreme cold air blowing from the Arctic causing below freezing temperatures with great quantities of snow and ice; as well as other related cataclysms; especially, in Canada and the United States. 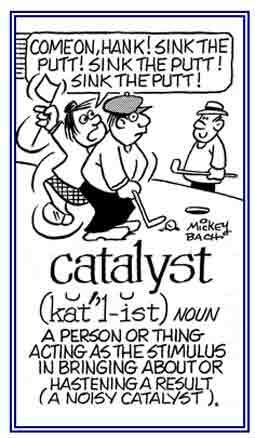 Revolutions that have been going on in several countries have resulted in severe cataclysms for many of the citizens living in those areas and also for some of the neighboring nations. 2. 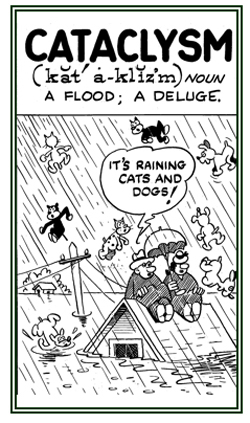 Etymology: from French cataclysme, which came via Latin from Greek kataklusmos, "deluge"; from kata, "down" + kluzein, "to wash". © ALL rights are reserved. 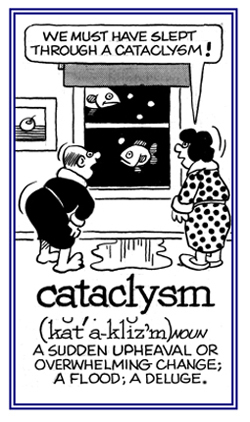 A reference to a cataclysm. 1. Pertaining to a great and general flood of water, a deluge: "The cataclysmic rain showers have altered the physical situations in the country because so many people have lost their homes and their living conditions have been devastated." 2. Figuratively, a political or social upheaval that sweeps away the old order of things: "The cataclysmic terror attacks have caused great changes in the social structures of the country." 3. A reference to sudden and violent upheavals or disasters that cause great changes in people's lives: "The severe flooding of a certain country was one cataclysmic disaster, but then the same territory suffered more cataclysmic sufferings from an extreme drought that destroyed crops and caused starvation for thousands of people." A giant cell involved in the absorption of cartilage. A congenital or acquired condition in which minute nodes are formed in the hair shafts; splitting and breaking, complete or incomplete, may occur at these points or nodes. Disequilibrium of the colloid system of the body that is associated with anaphylactic shock and thought to be caused by the presence of undigested colloids in the blood. A surgical instrument like a strong forceps. It was once used to crush and then extract the skull of a fetus in order to facilitate the delivery of the baby in cases of obstructed labor. Made up of minute fragmental particles, often used to designate a type of rock. Breaking or destroying trees; a destroyer of trees. Related break, broken-word units: frag-; rupt-. Showing page 2 out of 5 pages of 68 main-word entries or main-word-entry groups.